The global dental consumables market is anticipated in a report by Transparency Market Research (TMR) to find top players accounting for a larger share. Leading companies secured close to a 62.0% share of the market in a recent year. Owing to their excellent brand recognition and low pricing, Danaher Corporation, Henry Schein Inc., and Dentsply Sirona have managed to keep ahead of their competitors. With a view to strengthen their presence in the market, these companies are expected to continue to take part in joint ventures, takeovers, and mergers. 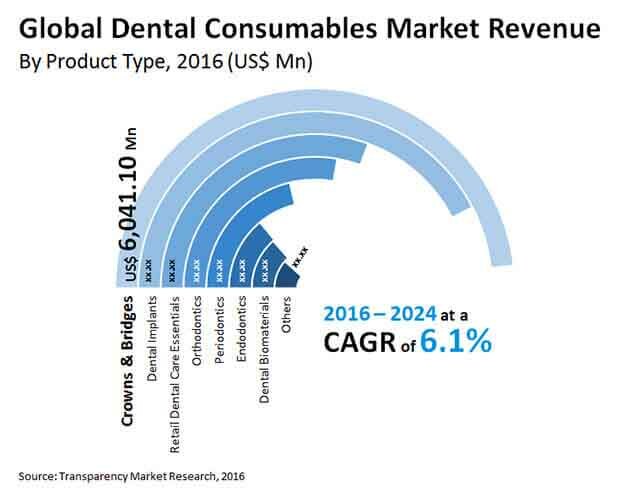 TMR prognosticates the global dental consumables market to grow strong at a 6.1% CAGR for the forecast tenure 2016-2024 to earn a US$33.4 bn by the end of 2024. By product, crowns and bridges could take hold of a greater share of the market while rising at a 7.2% CAGR. Regionally, the market is predicted to witness the rise of Europe as a frontrunner collecting a 41.1% share. Over the course of last few years, demand for dental consumables is envisaged to increase on the back of dental tourism in India, Turkey, and Hungary and the emergence of new services. A number of customers are being attracted to adopt dental treatments due to the less expensive nature of oral healthcare services offered in developing countries. Other factors that could work in the favor of the market are minimal government intervention in the operation of healthcare firms in developing economies, availability of improved treatment methods, and low labor cost. Overall growth of the global dental consumables market is foreseen to gain impetus as a result of the rising success rate of dental implants, especially for upper jaw treatments. This has given rise to the adoption of various types of procedures that involve dental implants. Sophisticated healthcare facilities in European countries such as Italy, Spain, the U.K., and Greece are projected to support the growth of the market. Large spending on research and development activities could act as a leading growth restraint for the global dental consumables market. This has resulted into expensive costing of products offered in the market. On the other hand, poor reimbursement policies are foretold to hamper the demand for dental consumables in the coming years. However, the global dental consumables market is projected to create lucrative prospects while riding on the rising prevalence of dental diseases such as tooth erosion, mouth sores, tooth decay, and gum decay. While this could benefit the market, there could be rewarding growth opportunities taking birth due to increasing incidence of chronic diseases. Furthermore, growing attention toward oral care, changing lifestyle, and improving disposable income are envisioned to increase the demand in the market.